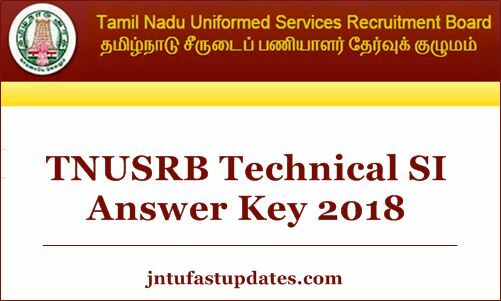 TNUSRB SI (Technical) Answer Key 2018: Tamil Nadu Uniformed Services Recruitment Board (TNUSRB) SI Technical written test was conducted on 30th September. Aspirants seeking to become Sub-Inspector (Technical) have competed for the TNUSRB SI written test on 30th September in their allotted examination centers. The organization conducted the test in a large number of places in the state of Tamil Nadu with proper care and supervision. Hopefuls competed for the Tamil Nadu SI examination can soon download the answer key/question paper solutions for all sets (A, B, C, D) and evaluate the score by comparing the answers from it. This will give an estimation regarding the probable score in the test, the level of competition, withstand in the competition and other aspects. Aspirants competed for TNUSRB Sub-inspector (Technical) examination can shortly download the answer keys from the official website tnusrb.tn.gov.in. Tamil Nadu Uniformed Services Recruitment Board is the state level department that works for the various functionalities. Annually the department releases various notifications to hire the suitable candidates into various designations. It recruits the candidates by conducting various tests based on the recruitment. This year the Tamil Nadu Police Sub-inspector (Technical) notification was released for 309 posts. Candidates wishing to become Sub-inspector in the state of Tamil Nadu have applied for the announced posts from 11th July to 12th August. TNSURB has got a huge number of applications from the eligible and interested candidates. Scrutinizing of suitable candidates will be done through the written test, physical standards test, physical eligibility test, and document verification rounds. Aspirants qualifying in all these rounds will be finally appointed Sub-inspector posts in the state of Tamil Nadu. The Tamil Nadu Uniformed Services Recruitment Board Usually releases the answer key after 3 to 4 days of the examination (tentatively). Hopefuls competed for the Tamil Nadu SI written test can stay patient until the conducting authority release the answer key. The TNUSRB will release the answer key in PDF format, in which, the competitors can find all the sets A, B, C, D. By comparing with the corresponding set the aspirants can check the score. Competitors who cannot wait for the official answer key release can download the unofficial answer keys provided by various coaching centers. The coaching institutes will upload the answer keys soon after the examination completed. The organizations will update the answers keys on an immediate basis after the examination held. Hopefuls can download the answer keys from the corresponding websites to check the answers. After the official answer key release, aspirants can again check to get the accurate score. Tamilnadu Preliminary Answer Key for SI(Technical) 2018, recruitment has been published. Any dispute/objection in Questions / Answers with documentary proof should be sent by post to IGP/MS, TNUSRB on or before 16/10/2018 @ 1800 Hrs. Steps to Check TNUSRB Police SI Answer Key 2018? tnusrbonline.org – Visit the page. Click on TNUSRB Police SI Answer Key Link. The TN Police Answer Key PDF for All sets A, B, C, D – will appear on the screen. Compare with the answers and estimate the score. Pls give 2018 si technical question paper.i really need that.